We are developing an affordable, open source, off the shelf wire bot. We are building an affordable, open source, off the shelf wire bot. CLICK ME, TO SEE MORE ! An interesting robotics platform for roboticists: Place a tool in a 3D space. 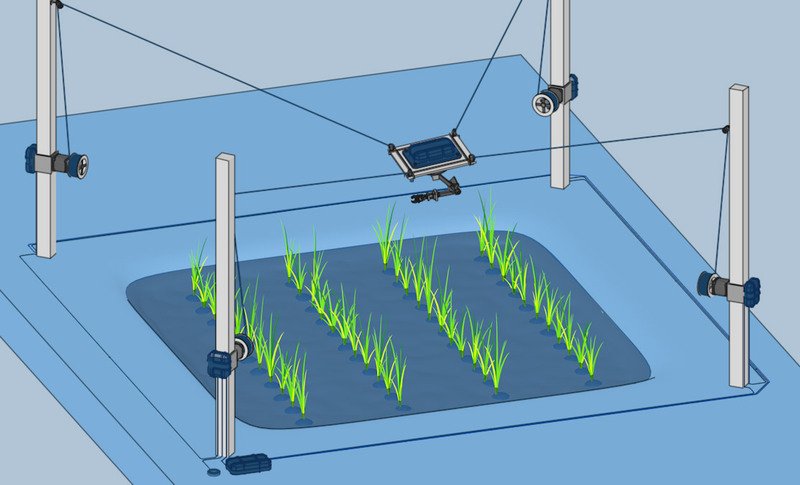 A tool to assist in farming: monitoring, weeds, pest removal, and watering. An open platform with interchangeable tools limited only by the creativity of its users. 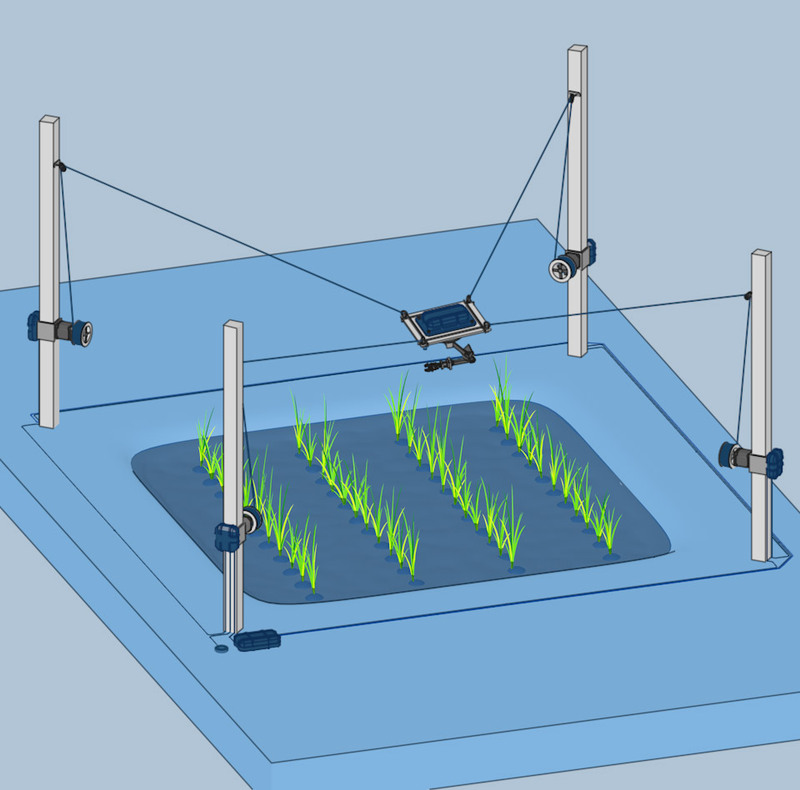 A tool to assist in farming: monitoring, weeding, pest removal, and watering. When moving to the Japanese countryside to find more space for the Fae Bot project, we became aware of a farming labor shortage which is an epidemic affecting all of rural Japan. To put it simply, the younger generation abandons the countryside for the city, leaving the older generations to carry out the farming. As you can imagine, this isn’t sustainable. It became clear how CNC machines might help these older farmers. This was before the FarmBot was well known. However, these farmers in Japan need help on a much larger scale. A wheeled robot would be constrained to a limited area of a 2D ground. A Fae Bot can work in a much bigger 3D volume. For cases where a robot has to move in a complex environment, especially in 3 dimensions, a suspended robot is much easier to use. It is easy to envision the Fae Bot utilizing a set of assembly tools such as screwdrivers, pliers, and soldering irons to assemble small electronics. For farming, possible tools could include: watering tools, weeding tools, temperature and humidity sensors, pH probe, sprayers for calibrated spraying of chemicals, seed planter, fruits harvester, and bugs remover. Roboticists will probably want to experiment attaching a variety of gripping tools or full robotic arms to the Fae Bot. Robots are an inextricable part of industry and society. Robots are more frequently used in classrooms and labs to teach a variety of theories and disciplines. Paired with software and curriculum, robots offer interesting new learning opportunities. It can be difficult to teach abstract concepts in math, science, technology and engineering using theory alone. Robots bring these concepts to life. Project based learning passes the theoretical into the tangible, thereby enhancing deep understanding via experience. Enter your email to get updates from Fae Bot!